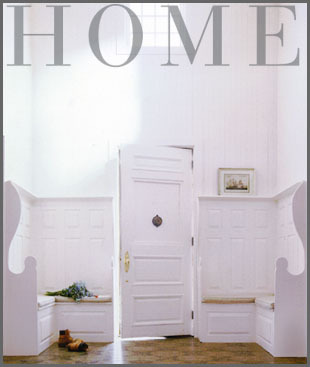 "I strive for graphic, elegant and appropriate interiors," says noted interior designer Victoria Hagan. 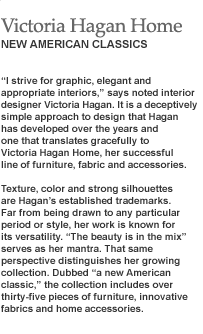 It is a deceptively simple approach to design that Hagan has developed over the years and one that translates gracefully to Victoria Hagan Home, her successful line of furniture, fabric and accessories. Texture, color and strong silhouettes are Hagan's established trademarks. Far from being drawn to any particular period or style, her work is known for its versatility. "The beauty is in the mix" serves as her mantra. That same perspective distinguishes her growing collection. Dubbed "a new American classic," the collection includes over thirty-five pieeces of furniture, innovative fabrics and home accessories.